Cranovator electric chain hoists are designed in modular construction for easy maintenance. The special features like low headroom, spur gears running on antifriction ball bearings with oil bath lubrication, motors confirming to IS 325 etc. 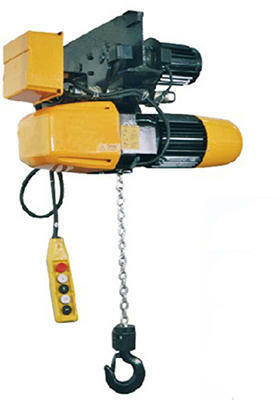 Cranovator chain hoists unbeatable to its price. Cranovator hoists are available in hook suspension type; push pull trolley type, hand geared trolley type, power travel trolley type and flexible trolley type to negotiate small radius. 1. CAPACITY: 500 kgs. to 2,000 kgs. 2. Concentrated design for high substance. 3. The chain hoist is tested at 125% overload before dispatch. 4. Quality designed forged steel top and bottom hooks. Precision shaped load sheave is mounted to assure minimum wear and smooth operation. Cranovator Industries LLP is a Leading Exporter and Suppliers of Material Handling Cranes & other related Equipment. We build Cranes for Hazardous & Non-Hazardous Environment with Explosion Proof Design confirming to International Safety Standards which make them Top Class and Reliable. All crane components are selected to ensure the high level of safety required for hazardous atmosphere in Chemical and Petrochemical Plants, Oil Refineries, Gas Power Plants, Waste Water Treatment Plants, Paint Shops and Other Industrial Sites. We supply durable lifting equipment for every stage of production for your Steel Mills, Scrapyards, Melts Shops, Warehouses and Other Industrial Sites. Our cranes have been designed and built to provide years of reliable and safe operation, with global service and an after sales network spanning all over the world. Our product range varies from , such as Single and Double Girder EOT Crane, Goliath Crane, Jib Crane, Electric Wire Rope Hoist, Chain Hoist, Industrial Elevator and customized material handling cranes.